"Clarence T. Brown will assist you or your group with learning the importance of properly aligning your organization's mission with your personal aspirations." 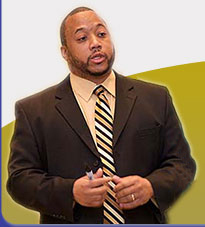 Clarence T. Brown, founder and Principal Partner of The Talking Bout, LLC, is a professional speaker, trainer, author, and “purpose facilitator.” He has turned his years of experience in for-profit and not-for-profit management into a living laboratory for audiences of all ages, stages, and backgrounds. Clarence uses his universal truths, “golden nuggets” and situational comedy to captivate, motivate and facilitate a transformation in every audience he serves. Utilizing interactive exercises Clarence, prompts participants to bring value to every presentation by allowing their experiences to be incorporated into group learning.